It’s a mild summer morning and we are making our way down the trail by our house. G is riding her bike, and I am walking behind her. My daughter is never in a hurry, a trait that I find both admirable and infuriating. As a result, her bike is still adorned with training wheels; she can’t seem to pedal fast enough to keep the it from toppling over. She comes to an abrupt halt and yells to me, “Mommy, we have to stop to smell the flowers.” And so begins our detour, which leads to a discussion about pollination and the value of bees and butterflies. We don’t have a schedule today and despite my impulse to hurry her along, I follow her lead. At last, she remounts her bike and asks for a push. I keep thinking that as she watches her friends shed their training wheels she will be motivated, but when the topic comes up she says, “I don’t have to be like everyone else.” And so she pedals on, at her own speed, with her training wheels keeping her upright. It seems like I am always trying to get her to move faster. But she is always happy to stop to investigate a snail on the sidewalk, find pictures in the clouds, or point out patterns in the sidewalk. Having a child has challenged my compulsion to be on time; it has created an unpredictable variable that I must navigate. Our house is always a disaster. At any given moment there is an art project in progress on our dining room table. There are sewing projects, collections of rocks, and elaborate cities made out of blocks and boxes. Everything has potential: bottle tops, egg cartons, the tops of dried up markers. A solar system and a life-size recreation of the human body lived in our dining room for months. But I love watching her create; her process fascinates me so much that the constant clutter seems worthwhile. She will hold up a new creation, beaming with pride and say, “I think it’s as good as a Picasso. Let’s send it to the Met.” At six, she is a creator and an optimist, seeing possibility in everything. 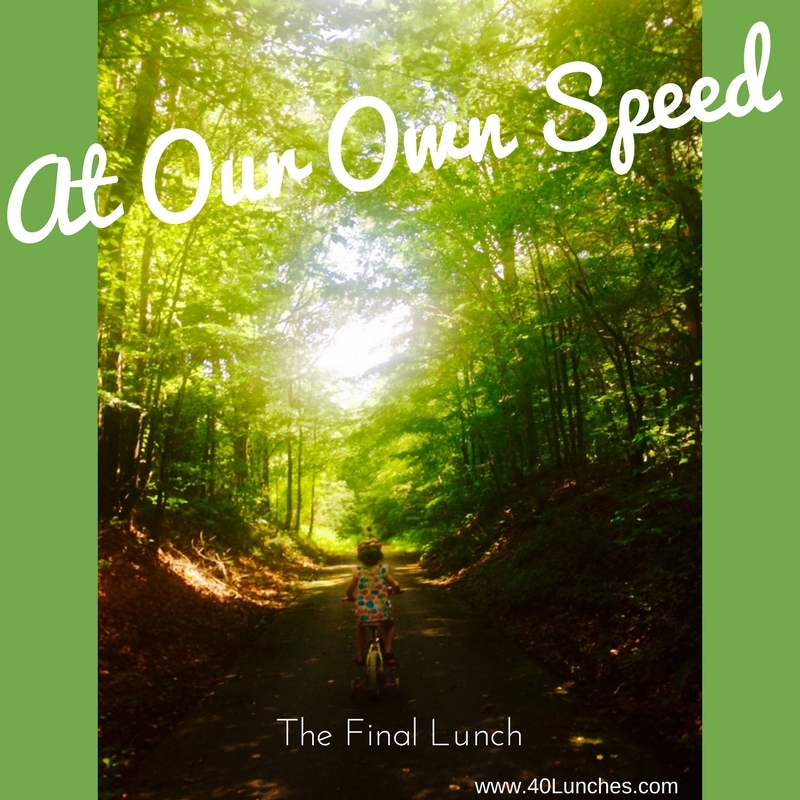 The 40 Lunches Project began with my grandmother, now 102. If she is the person who had the most influence over my first 40 years of my life, then my daughter is the person who most inspires the next 40. She challenges me to acknowledge my shortcomings and be my best self. She has changed the lens through which I see the world and the way I make decisions. She was excited when I asked if she would be my final lunch. In the past she's always wanted to sit next to me at restaurants, but lately she's chosen to sit across. I like being able to look her in the eye when we talk. I ask her where she thinks she'll be in 40 years, a question she finds amusing. She says she'll be a marine biologist living in San Diego and that I'll live with her. She turns serious for a moment and says, "I hope you'll live to be as old as grandmother, so that we can be together for a long time." Me too, kiddo. The 40 Lunches Project has been one of the best things I’ve ever done for myself, but in many ways, it’s been for her as well. Hopefully, one day she will be able to look back on all of these stories and see me not just as a mother, but also as a person. She’ll be able to say that her mother had an idea, went on an adventure, and had something dynamic to show for it. When I think about the next 40 years - when I envision what those years will look like - it’s easy to jump to the end while overlooking everything in-between. But I need to slow down and see the possibilities, to follow my daughter's example, because these next 40 years will likely fly by. Thank you for taking the time to read and support the 40 Lunches Project. You can continue to follow along on Facebook. It started with a dinner that turned into a date. Tim and I had known one another for a while, but our relationship had always been professional. When that changed, our courtship was fast and furious. There were weekend adventures and lazy Saturday mornings. We threw dinner parties and went to galas. Our first Christmas together, he gave me a first edition copy of To Kill A Mockingbird; I cried because I knew he understood what I valued. I opened my heart to another person in a way I never had before. It was magical. Our wedding was exactly what we wanted it to be: intimate and original. He planned the honeymoon; it was perfect. But then the magic of the courtship was over, and we had to figure out how to function as a married couple. 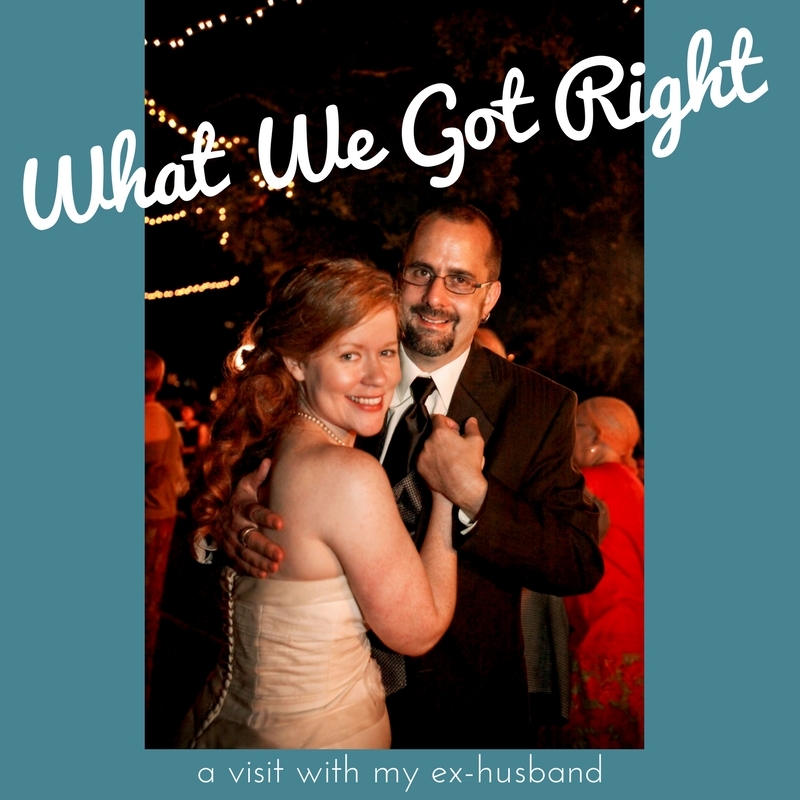 The list of things we did wrong is lengthy. There were choices made along the way that we both regret. We soldiered on denying the inevitable. Then one day I woke up and realized I didn’t like who I had become. It was time to move on. Our divorce was anti-climactic; by the time we filed, we had simply fallen out of love. Since we share the responsibility of raising another human being, I had to learn the art of collaboration in ways I never imagined. Tim is a good dad and is as present as he can be considering the distance between us. He respects what I do and when he can he steps up to help with childcare when I need to travel for work. When there are issues, we have family meetings – the three of us – over Facetime. It’s not ideal and it’s not what either of us imagined. But most of the time, it feels like it works. We made a commitment to celebrate birthdays and holidays together. At some point that might change, but for now it allows us to both share in those magical moments together. He stays at our house, and at night he and our daughter pile up in bed together and watch movies. It’s not the family dynamic I hoped for. I still grieve that loss. But what our daughter sees are two people who have been able to set aside hurt and resentment to parent as a united front. She sees that two people can love one another without being in love. She sees her dad as a model of a man. He sends thoughtful gifts on Mother’s Day and my birthday, and when he is with us he helps out by fixing things around the house. She watches him cook her dinner and do her laundry when they are together. When he takes her to work, she sees his impeccable work ethic. Which isn’t to say there aren’t still conflicts. It’s not easy; I still struggle with letting go and not micro-manage. Sometimes I’m more successful than others. However, my married friends are quick to point out that many of the issues we have with co-parenting are the same that they have in seemingly solid marriages. I send him a message asking if he’d be willing to be part of the project and he quickly agrees. He responds saying, “If the tough moments make sense to write about, please do. Sometimes our shortcomings (at least mine) give us the greatest growth. I have always and will continue to support you in your art.” So on this Sunday afternoon, instead of lunch, we meet in Atlanta and take our daughter to the aquarium. We each hold her hand as we walk through the crowds of people, and for just a moment we look like any other family. There have been a lot of difficult questions lately, and we struggle to find the most appropriate way to address them. As we leave she says, “If you still like each other, why did you have to get divorced?” My heart breaks. And honestly, I’ve asked myself that question too sometimes. There are moments when we are all together and something about it feels easy, natural, and right. We always did fun well; it was the challenges that we couldn't navigate. It's hard knowing that our inability to stay married has caused our daughter so much heartache. But I also know that our failure of one another doesn't mean that we are a failure as parents. I know that in the end we made the right decision - for us and for her. If you've enjoyed this post, please share it on Facebook. Thank you for supporting the 40 Lunches Project. I graduated from high school early and moved to New York where I spent what would have been my senior year of high school working. I babysat, worked as a Broadway usherette, and did office work at the Theatre Development Fund. Then one day a letter arrived from my mother that said, “Enroll in college or come home.” Worried I would have to leave New York, I found myself highly motivated to continue my education. My roommate, an awesome Cajun chick from Lafayette, had a brochure for Purchase College. It was a small SUNY school with an emphasis on the arts, and with my well-invested year in New York, I qualified for in-state tuition. Win/win. I applied and enrolled sight unseen. After spending a night in the dorms for freshman orientation, I quickly realized that I was not made for communal living. Instead, I rented an apartment in Hell’s Kitchen and commuted. I would walk to Grand Central Station, take the train to White Plains, then a bus to Purchase. Door to door it took 2 hours. At 18, it seemed like a good idea. Coming from Alabama, Purchase exposed me to a diverse mix of students from a myriad of backgrounds. Pouring over the course catalog during registration, my mind was blown. For my freshman seminar I took a literature course called Exploding American Identities, where I was introduced to Latino, Asian, and Native American voices. There was the philosophy class where I read Kant and Marx and a course on the Psychology of Gender. Then I begged my way into The Political Economy of AIDS a three hour seminar only open to upperclassmen. It was the mid-90’s and the AIDS crisis defined our generation. Hugely popular on campus, it was taught in a lecture hall by Kim Christensen, a favorite among students. I never missed a class. She took a topic that was so complex and broke it down in a ways that made it accessible. She found ways to teach us about the past in a way that resonated in our contemporary world. There was no formality with Kim, but she didn’t need it to gain our respect and admiration. Kim was the professor that the students loved, the pied piper on campus who motivated students to stand up and fight back. Her classes were always full. The things I learned in Kim’s class have been just as beneficial to me as a writer as the skills I learned in graduate school. I learned about the balance of power, about the role of women and minorities in society, and the relationship between money and power – all issues that inform the characters I write and the stories I tell. Kim taught at Purchase from 1985-2010. A four- time recipient of the Students’ Union Award for Outstanding Teaching, Kim was an outspoken ally. She also earned the President’s Award for Innovative Pedagogy and the SUNY Chancellor’s Award for Distinguished College Teaching. Her research focuses on the intersection of economics and public policy with an emphasis on race, gender, class, and labor. I eagerly took every class she offered; by the time I graduated I had enough credits for a minor in economics. There were certainly other dynamic teachers along the way. I read Aristotle, Ibsen, deTocqueville, bell hooks, Mary Wollstonecraft, and Adrienne Rich. I lobbied for a seat in a playwriting class, which was only open to drama studies majors, armed with samples of the short plays I had written. I started out as a psych major, but a brush with behavioral statistics led me to change my major to women’s studies. My mother wondered what I would do with a degree in women’s studies: I became a writer. I’ve become an advocate for the liberal arts, especially for young artists. A foundation in the liberal arts provides artists with a well-rounded education, which then informs the work they create. Additionally, by providing students with access to the arts we give them an opportunity to engage in the creative process in a way that allows them to not just analyze the work, but to learn by embodying the characters. Artists, like academics, examine, record, and endeavor to understand the world around them. Theatre artists must learn to see the world through the lens of the characters they create, which is essentially the goal of liberal arts education. It’s been 19 years since I last spoke to Kim. I was disappointed to learn she had left Purchase, but an internet search found her teaching at Sarah Lawrence. She was quick to respond when I reached out. After trying to coordinate schedules while I was in New York, we had to settle on a chat by phone. Hearing her voice and laugh immediately brought back memories. I was able to tell her what her classes meant to me, how they shaped my worldview, and informed my writing. As I continue to grow as a teacher, I look to the dynamic teachers I had along the way for inspiration. 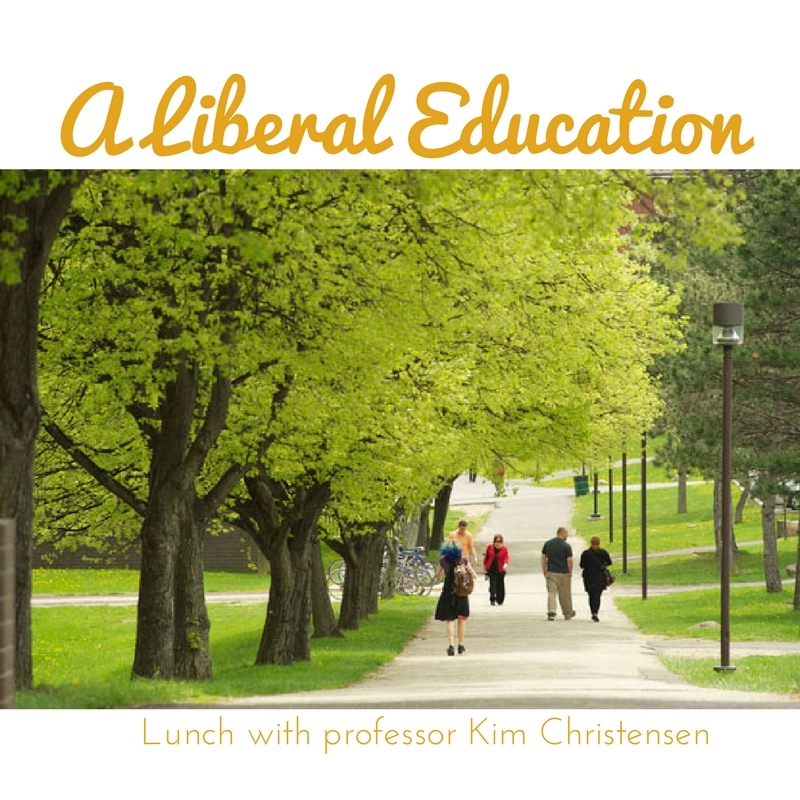 Kim’s classes not only forced me to step outside my comfort zone, but they also served as safe spaces where difficult topics could be discussed openly. She wasn’t just a professor; she was also an advocate, a cheerleader, and a truth teller. Now that I’ve found my way to academia, I see the value in the liberal arts in a new way. There is a certain excitement when students start making connections between the texts we read in class and the topics they have studied in other classes. They begin to see the interconnectedness of the world around them. My goal is to challenge them to take creative risks, think critically, and work collaboratively. All of these skills will serve them well. If you have enjoyed this post, please share it on social media. You can also follow along on Facebook or read about my other lunches. My first job in New York was working as a Broadway usherette. I wore a scarf and a name tag, and I reminded people that flash photography wasn’t allowed. It was an ideal job for a theatre kid. I subbed around to different theatres, filling in where I was needed, seeing shows in the process. I wrote my first play by flashlight while sitting in darkness in the back of the house; Broadway became my master class. When I was a freshman in college I was assigned to the Cort Theatre. The show that was playing was a revival of The Heiress, the 1947 stage adaptation of the Henry James novel, Washington Square. Begrudgingly I went, convinced that it would be dated and dull. But soon after the show began a woman appeared at the top of the stairs and seemingly floated, effortlessly, to the bottom. The actress was Cherry Jones. I was captivated. Her work in The Heiress earned her a Tony Award. It was a well-deserved affirmation for an actor who was also a Tony-nominee for Our Country’s Good and had worked consistently in regional and off-Broadway theatres for more than 15 years. Cherry went on to win another Tony Award for Doubt and an Emmy for her portrayal of the President on “24”. Along the way there have been movies as well, but she always returns to the theatre. Born and raised in Paris, TN, she still has a hint of an accent. She too was inspired by a moment in the theatre: She often tells the story of seeing Colleen Dewhurst in A Moon for the Misbegotten when she was 16. It proved to be a transformative experience. Encouraged by her parents, she went on to study theatre at Carnegie Mellon before moving to New York. Sometimes there are people who live in our periphery, just on the outside, but are seemingly always present in some way. They are people we cross paths with in the moments when we need them most. For 20 years, Cherry flowed in and out of my life - at moments when I was somehow questioning my own work - always asking about my writing and offering encouragement along the way. There was an embarrassing fangirl moment at New York Theatre Workshop and an afternoon hanging out in her trailer on set. Then ten years passed and we ended up on top of a mountain in Tennessee together where we talked about theatre, how we missed our mothers, and growing up in the South. We kept in touch and soon this person who I had always admired began to feel like a friend. We meet for lunch in the theatre district while I’m on break from rehearsal. At a cozy table tucked away in the corner, she tells me about her recent London run of The Glass Menagerie, a remount of the same production she starred in on Broadway. Gracious and unassuming, Cherry is easy to talk to. She asks about my daughter and my work saying, “Elyzabeth, I always want to know your trajectory.” The sound of her Southern accent feels familiar and comforting, and I soon hear my own accent rising to meet hers. Theatre is meant to be a transformative experience: for the characters, for the audience, and at times, for the actors who bring the stories to life. 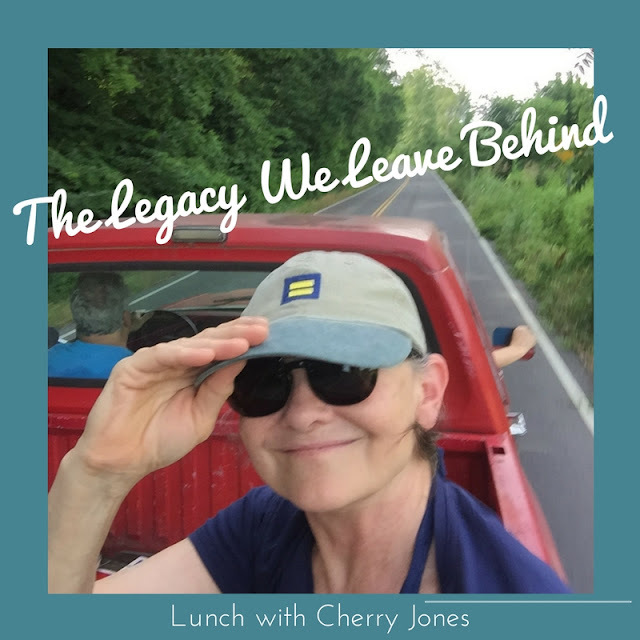 Cherry has made a career out of telling other people’s stories, but in the process she has written her own story; it’s the story of a person who has spent a lifetime doing what she loves. It’s been a remarkable journey so far. Her legacy will not come in the form of trophies and awards, though there have been many earned over the years, but rather by the people she’s inspired. Now the roles have shifted, and there is a new generation of young women who will grow up and tell the story of the time they saw Cherry Jones on stage and how it inspired them to be artists. If you've enjoyed this post share it with a friend and follow along on Facebook. My mother always said that money was a good thing to donate, but sometimes your time was more valuable. She tirelessly counseled those in need through 12 Step service work. Following her example, I have volunteered and mentored since high school. But when I became a parent, I found that even time was something I couldn’t spare. As I look toward the next 40 years, I want to find that time again, because now my daughter is old enough to learn from my example. I want to walk the walk. Dennis O’Keefe planned on becoming a priest. Originally a member of the Paulist Father’s Community, he was ordained a deacon in 1967. He was scheduled to takes his vows in 1968 but postponed his ordination. Searching for direction, he arrived in Mobile, Alabama in 1972 where he worked with an African-American parish in the Plateau community. Then he met Cathy shortly after his arrival and decided to leave the Paulists to marry. While Dennis never became a priest, he has spent his life in the service of others. Devoted to their faith, Dennis and Cathy raised five children while continuing their mutual commitment to serving the community. For years, Dennis lead government funded outreach programs that targeted under-served and under-represented communities along the Gulf Coast. As a family, they volunteered at with L’arche, a residential community for adults with developmental disabilities. In 1996 he became their regional coordinator. With years of experience doing outreach, Dennis felt comfortable advocating for at-risk communities. The job became all-consuming, and eventually he decided to only work part time, largely serving in a pastoral role. But perhaps his most important work has been with death row inmates at Alabama’s Holman Prison. He was introduced to the ministry through the Kairos community, which sponsors ecumenical, faith-based weekends at the prison twice a year. The program presents the gospel in a living way – Jesus is right here and we believe it, we find Jesus in you, and you are loved unconditionally by God. The program, which has a presence worldwide, begins on Friday morning and ends on Sunday. Prisoners look forward to their visits, not just for the fellowship, but also for the home cooked meals prepared by volunteers. Once an inmate has gone through the program they can then attend monthly meetings led by Kairos members. The chaplain assigned to the prison invited Dennis to be a volunteer chaplain offering pastoral care to the inmates. Since he had already been ordained a deacon, he was quickly approved by the state. His new role earned him access to the prisoners; he is able to visit any day of the week and is accessible to any prisoner who wants to talk. Confined to 5x7 cells, the inmates look forward to the opportunity for human contact. Death row inmates can’t work to buy things in the commissary, so they rely on friends and family to put money in their account. The prison isn’t air-conditioned, making the environment stifling in the Alabama heat. They are allowed an hour outside each day. 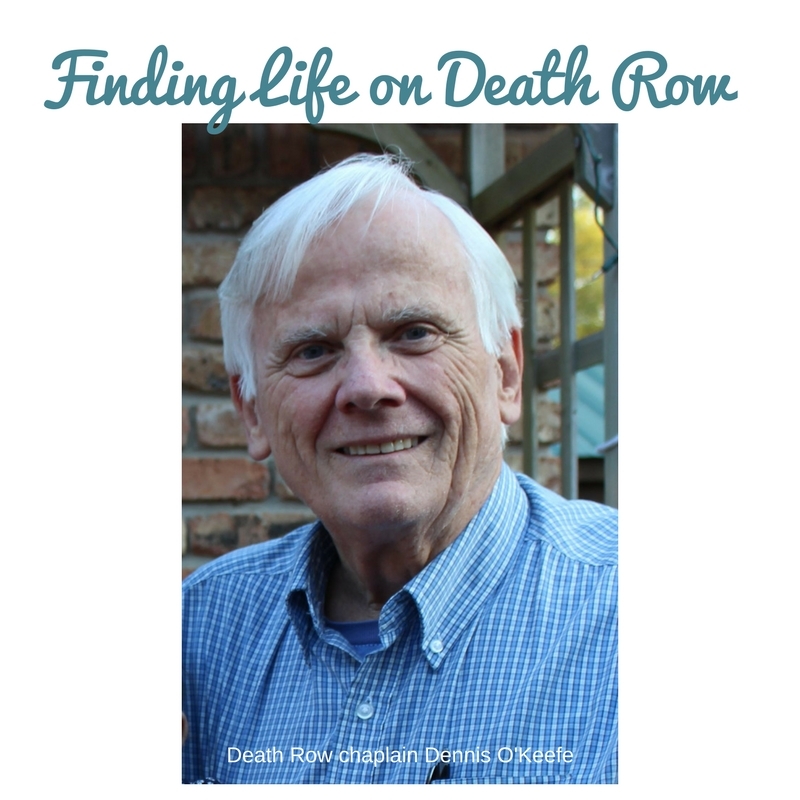 Eventually Dennis established relationships with some of the men on death row. He has now witnessed two executions. For the three days prior to their execution inmates are offered special benefits. Friends, family, clergy, and lawyers are a steady presence for most of the men. Stories are told, tears are shed, and there is prayer as they hold out hope for a stay of execution. On their last day they are provided their last meal and led to a holding cell where they are processed and placed on gurney. There are last words and a final prayer. Then you wait. Dennis and I meet one morning at Starbucks. Having grown up with Dennis’ children, I had pieced together parts of his journey. So we sit together, just the two of us, and over coffee he tells me his story. He starts with his desire to become a priest, but when he talks about his work at the prison, his passion for his work becomes clear. “There is a peace I feel when I go in there. You find them in a different way,” he says. “Many men find a connection to God in prison, not out of fear or their own mortality, but because they are essentially living a monastic life,” he explains. The work of Kairos has had a positive impact on the spiritual life of the prisoners. Now the 16 men on death row host their own service each week with supervision. They preach, usually in an evangelical style. I listen, admiring his commitment to the cause and his ability to see the good in these men. “Could you transpose that to the outside world? Would they be able to love and accept these same guys?” he asks. “I don’t know. If you've enjoyed this post, please share it on Facebook and Twitter. You can follow along with 40 Lunches on Facebook.